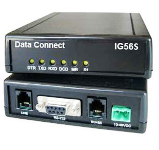 The Data Connect DCE/IG56S high-speed V.92 security dial-line modems are designed and manufactured for rugged industrial applications over the Public Switched Telephone Network (PSTN) with security features such as password log-in and security call-back. The DCE/IG56S utillizes the industries latest V.92 modem technology to deliver outstanding features, performance,and reliability in one cost-effective solution. in reception and up to 48 kbps in transmission are supported. The modems incorporate the latest data-compression and error- correction standards for improved data transmission and reception over marginal and poor-quality telephone lines. Multiple levels of security with password verification and security call back keep your valuable data secure from intruders. The DCE/IG56S modems are powered by a wide range of AC and DC power supply voltages. Its low power consumption and low stand-by current technology design makes the DCE/IG56S ideal for a battery-powered system as well as regular AC powered operations.